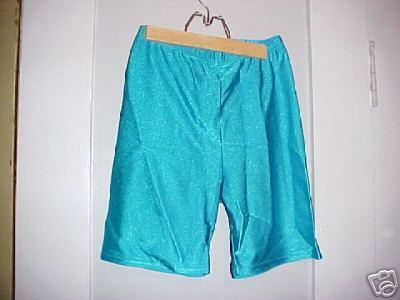 These turquoise Body Co shorts I won at an eBay auction in 2003. Seller was sportingguy27, and it was given this description at the auction: You are bidding on a great pair of Soft Lycra Shorts by BODY CO. They are shiny Aqua and are made of a Soft Nylon Lycra Spandex mix, a very stretchy and shiny material. They are a size Adult Large and are in Excellent condition.